Functional tricuspid regurgitation (TR) represents an important unmet need in clinical cardiology given its prevalence, adverse prognostic impact and symptom burden associated with progressive right heart failure. 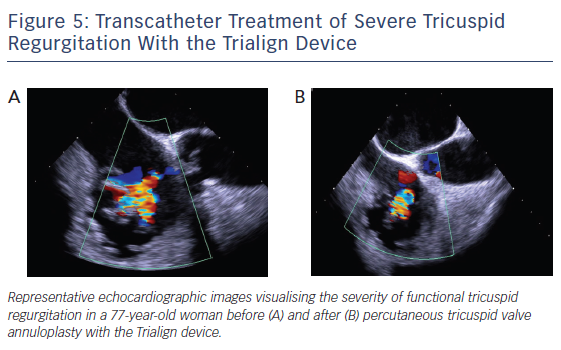 Several transcatheter techniques are currently in early clinical testing to provide alternative treatment options for patients deemed unsuitable for tricuspid valve surgery. Amongst them, the TrialignTM device (Mitralign, Inc.) represents a novel percutaneous tricuspid valve annuloplasty technique, which aims to reduce tricuspid annular dilatation in functional TR by delivering and cinching two pledgeted sutures to the posterior portion of the tricuspid annulus via transjugular access. Early clinical data suggest the Trialign technique is safe and feasible, and associated with an improvement in quality-of-life measures. However, further studies are needed to confirm these data in larger cohorts of patients with longer follow up. In addition, future trials need to address the question whether TR reduction with the Trialign and other devices leads to an improvement in the patient’s functional status and prognosis, over and above medical treatment alone. In recent years a growing number of elderly patients with left-sided heart valve disease are treated by transcatheter valve technologies, and accumulating evidence suggests residual TR remains a predictor of adverse outcome in these patients. In patients with mitral regurgitation undergoing MitraClip® (Abbott Vascular) implantation, increasing TR severity correlates with higher one-year mortality and bleeding rates.14,15 Severity of TR in association with aortic stenosis is frequently progressive despite transcatheter aortic valve implantation.16 In addition, persistence of moderate or greater TR 6 months after transcatheter aortic valve implantation, but not preoperative TR severity, is associated with lower survival after adjustment for clinical variables and echocardiographic parameters of right ventricular function.16,17 Given the incidence and prognostic relevance of TR on the one hand and the challenges in providing treatment options on the other, there is increasing interest in the development of transcatheter approaches for treating TR. The tricuspid annulus is a complex and dynamic 3D structure that differs from the more symmetric saddle-shaped anatomy of the mitral annulus and is altered in the presence of different loading conditions of the right heart chambers.18 In addition, the tricuspid annular area changes significantly during the respiratory and cardiac cycle with an almost one-third increase during atrial systole and again in late systole/early diastole.19 Under physiological conditions the tricuspid annulus is elliptic or ‘egg’-shaped when imaged in a short-axis view (see Figure 1). Importantly, 3D-echocardiographic data suggest a normal tricuspid annulus is non-planar, exerting two high points (stretched towards the right atrium) anteroseptal adjacent to the aortic valve and posterolateral, as well as two low points (stretched towards the right ventricular apex) anterolateral and posteroseptal.20 The septal tricuspid leaflet arises directly from the tricuspid annulus above the interventricular septum and this medial portion of the tricuspid annulus is relatively fixed due to its position between the fibrous trigones, analogous to the intertrigonal portion of the mitral annulus.4 Therefore, the tricuspid annulus primarily dilates along the free wall, i.e. at the anterior and posterior leaflet attachments.7 In contrast to normal tricuspid annular geometry where the septolateral distance is larger than the anteroposterior distance, the tricuspid annulus becomes more circular and planar when functional dilatation occurs (see Figure 1). The displacement of the low and high points of the tricuspid annulus likely alters the papillary muscle-to-leaflet and annulus relationship, thereby contributing to leaflet tethering in functional TR. Several devices are currently in preclinical and early-clinical evaluation for transcatheter treatment of functional TR.21 However, the number of patients treated is still low and long-term haemodynamic and clinical benefits are unknown. As compared to interventional therapies targeted to the aortic or mitral valve, transcatheter treatment of TR has to face a number of additional anatomical challenges, as summarised in Figure 2. In particular, device steering via femoral access is hampered due to the sharp angle between the inferior vena cava and the tricuspid valve annular plane. Catheter navigation in the enlarged right heart chambers can be challenging. Application of annular-based devices has to account for the thin and non-uniform tissue of the tricuspid annulus and leaflets as well as the course of the right coronary artery. The Trialign device is a transjugular suture-based tricuspid valve annuloplasty system that reduces tricuspid annular diameter through tissue plication.29 The underlying transcatheter annuloplasty technique, which is known as the Mitralign device, was originally designed for the treatment of functional mitral regurgitation and first successfully applied in 2013.29 For mitral regurgitation, two pairs of sutured pledget implants are placed in the mitral annulus in the medial (P1) and lateral (P3) scallop regions via transfemoral access through the aorta across the aortic valve. Plication is achieved by advancing a dedicated plication lock device over the two sutures attached to each pair of pledgets and, finally, a stainless steel lock is placed to maintain plication of the mitral annulus.29 In 2016, Nickenig et al. reported the results of a safety, feasibility and efficacy study testing the Mitralign system in 71 patients with functional mitral regurgitation and high surgical risk.30 The device was successfully implanted in 50 of 71 patients (70.4 %) with no intraprocedural deaths or necessity for acute conversion to open heart surgery. Cardiac tamponade requiring pericardiocentesis occurred in 4 patients, likely related to catheter manipulation within the ventricle. During 6 months of follow up, non-urgent mitral valve surgery was performed in one patient (2.4 %) and non-urgent percutaneous mitral valve repair in seven patients (17.1 %). Although beneficial effects on left ventricular volumes, mitral valve annular geometry and leaflet coaptation were observed after 6 months of follow up, mitral regurgitation itself improved only in 50 % of treated patients. The percentage of patients presenting with New York Heart Association (NYHA) functional class ≥III was reduced by 56 % and the 6-min walking distance significantly increased during follow up by 56 metres.30 Further data on the performance of the Mitralign device in patients with functional mitral regurgitation are not yet available. 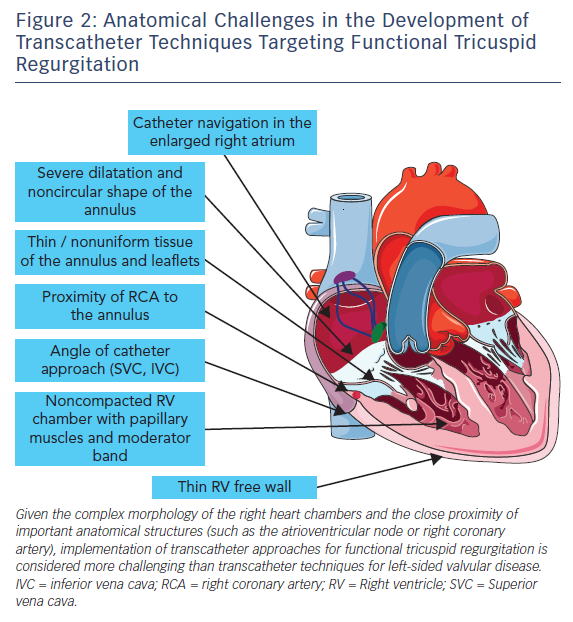 A comprehensive clinical, laboratory, echocardiographic and invasive evaluation is needed to assess whether a patient is suited for percutaneous tricuspid valve annuloplasty with the Trialign system. All patients treated so far were either enrolled in safety and performance studies or compassionate use cases. According to current study protocols, patients aged ≥18 and ≤80 years with moderate-to-severe chronic functional TR are considered symptomatic despite guideline-directed medical therapy (i.e. NYHA class II, III or ambulatory IV) are considered. A heart team decision is needed to rule out the need for left-sided valve surgery and to decide whether tricuspid annuloplasty would be suited for the patient. 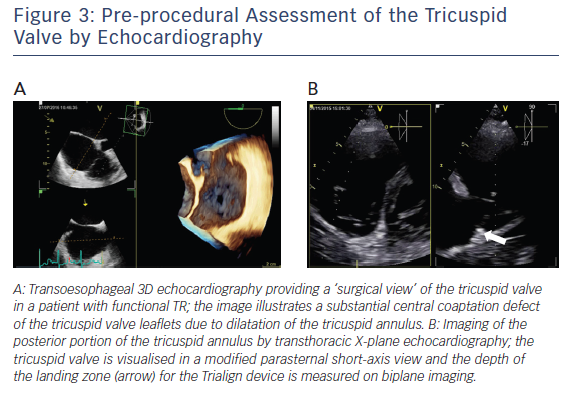 Transthoracic and transoesophageal 2D/3D echocardiography is central to the evaluation of percutaneous tricuspid valve annuloplasty with the Trialign system, including deep oesophageal and transgastric imaging of the tricuspid valve (see Figure 3A). Current eligibility criteria for the Trialign procedure include a left ventricular ejection fraction ≥30 %, tricuspid annular plane systolic excursion (TAPSE) ≥13 mm and systolic pulmonary artery pressure (sPAP) ≤60 mmHg. Furthermore, emphasis needs to be paid on the tricuspid valve annular diameter (≥40 mm [or 21 mm/m2] and ≤55 mm [or 29 mm/m2]), tricuspid effective regurgitant orifice area (EROA; ≤1.2 cm2) and sufficient posterior annular dimension for device implantation. The latter is best visualised on transthoracic X-plane imaging of the tricuspid valve in a parasternal short-axis view (see Figure 3B). Percutaneous tricuspid valve annuloplasty with the Trialign system requires two 14 F sheaths placed in the ventral and lateral portion of the right internal jugular vein with a distance of approximately 2 cm to avoid bleeding complications. In addition, a guide catheter needs to be placed in the right coronary artery via femoral access because of the close proximity of the right coronary artery to the posterior portion of the tricuspid annulus. As a first step, a dedicated deflectable tricuspid guide catheter (see Figure 4A) is advanced into the right ventricle via jugular access.31,35 The tricuspid guide catheter is designed to direct all subsequent procedural devices across the tricuspid valve orifice and towards the tricuspid annulus by advancement/retraction, deflection and rotation. Next, a tricuspid wire delivery catheter is advanced to access the ventricular side of the tricuspid annulus at the target location for pledget delivery. With the help of transoesophageal 2D/3D echocardiography and fluoroscopy, the tricuspid wire delivery catheter is directed to the septo-posterior location. Then, a crossing wire is advanced through the lumen of the tricuspid wire delivery catheter. The crossing wire is used to cross the annulus from the ventricular to atrial side, thereby providing a path for pledget delivery through the tricuspid annulus. It is connected to a radiofrequency energy source and radiofrequency energy is employed at the distal tip while moving the crossing wire through the tricuspid annular tissue (see Figure 4B). Afterwards, the position of the crossing wire along the tricuspid annulus and the annular depth is confirmed by echocardiography. Once the crossing wire is properly placed at the septo-posterior portion of the tricuspid annulus the distal tip of the crossing wire is trapped in the right atrium by an endovascular snare system and retracted through the jugular access site. The second pledget is positioned next to the anteroposterior commissure of the tricuspid annulus following the same technique as described for the septo-posterior location. A distance of 25–28 mm between the pledget in the anteroposterior and septo-posterior location is recommended (see Figure 4C). Of note, to provide complete coverage of the posterior portion of the tricuspid annulus from the anteroposterior to the septo-posterior commissure, investigators have tried to implant two pairs of pledgets (see Figure 4D). Whether the two-pair strategy is superior to implantation of a single pair of pledgets has not yet been tested. A dedicated plication lock delivery catheter is advanced over both pledget sutures to the atrial side of the tricuspid annulus. By advancing the plication lock delivery catheter towards the annulus, the portion of the tricuspid annulus and posterior tricuspid leaflet in-between the two pledgets is plicated. To secure plication the pledget delivery catheter deploys a lock onto the sutures. Finally, a suture cutter catheter is tracked over the locked sutures to the lock implant. The catheter tip encloses a blade that cuts both sutures right above the lock and allows removal of the proximal portion of the sutures. Representative echocardiographic images of a patient treated with a single pair of pledgets are shown in Figure 5. After publication of the first successful case of transcatheter treatment of functional TR with the Trialign device, another report emphasized the possibility of early failure due to pledget dehiscence.36 Recently, Hahn et al. reported the results of the Early Feasibility of the Mitralign Percutaneous Tricuspid Valve Annuloplasty System Also Known as Trialign (SCOUT) trial (NCT02574650), constituting the first report of an early feasibility trial for a transcatheter tricuspid valve device.35 The SCOUT trial is prospective, single-arm, multicentre, early feasibility study of the Trialign device and recruited 15 symptomatic patients (i.e. NYHA functional class ≥II) with moderate or greater functional TR. Detailed echocardiographic and quality-of-life measurements (i.e. NYHA functional class, Minnesota Living with Heart Failure Questionnaire and 6-min walk test) were performed at baseline and 30 days. Of note, all patients underwent successful device implantation with no serious complications. In one patient, coronary angiography after pledget delivery and lock showed tenting of the distal right coronary artery in the region of the plication with significant narrowing, ST-segment elevations on ECG and a fractional flow reserve of 0.57, requiring stent implantation. On follow up after 30 days, three patients had echocardiographic evidence of a single pledget detachment from the annulus.35 Significant reductions in tricuspid annular diameter and EROA were observed in the remaining patients. Left ventricular ejection fraction and right ventricular function (as measured by TAPSE) remained unchanged on echocardiography 30 days after the procedure. Despite a reduction of TR in the as-treated population (i.e. patients without pledget detachment) no significant difference in estimated sPAP was observed on echocardiography.35 Interestingly, left ventricular outflow tract stroke volume as measured by Doppler echocardiography increased following TR treatment with the Trialign device. Finally, reduction of TR in the intention-to-treat cohort translated into improvements in NYHA functional class, Minnesota Living with Heart Failure Questionnaire score and 6-min walking distance.35 The ongoing Safety and Performance of the Trialign Percutaneous Tricuspid Valve Annuloplasty System (SCOUT-II) study is a prospective, single‐arm, multicentre study in Europe and the US recruiting patients with moderate-to-severe TR in whom left‐sided valve surgery is not planned. SCOUT-II further investigates safety and performance of the Trialign system with follow up planned up to 2 years and is a European CE-Mark study. Moderate-to-severe TR is a common problem in clinical cardiology and is associated with significant morbidity and reduced long-term survival. Several transcatheter techniques are currently in preclinical and early clinical evaluation as a novel treatment option for patients with symptomatic functional TR and high surgical risk. 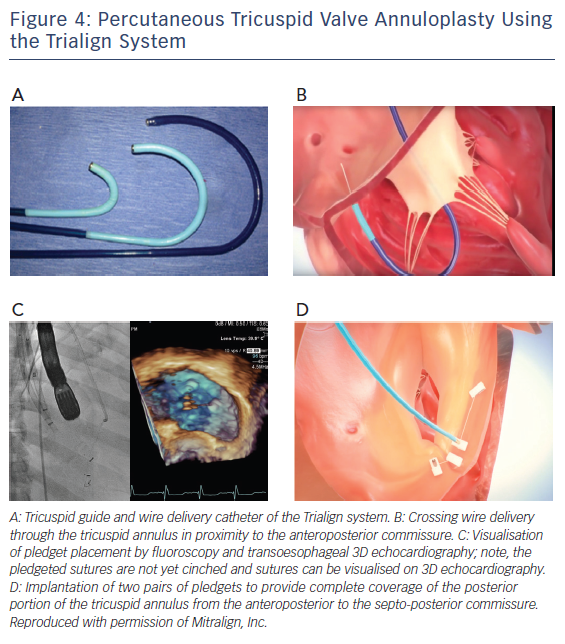 The Trialign device is a novel percutaneous tricuspid valve annuloplasty technique targeting the pathophysiologic hallmark of functional TR, i.e. dilatation of the tricuspid annulus along its posterior portion. By delivering and cinching two pledgeted sutures the posterior portion of the tricuspid annulus and the posterior tricuspid leaflet is plicated. The SCOUT trial has confirmed the safety and feasibility of the device. However, clinical data are still limited, and further studies are needed to confirm these data in larger cohorts of patients and to investigate whether applying the Trialign device leads to clinical benefit in patients with functional TR. Rodés-Cabau J, Taramasso M, O’Gara PT. Diagnosis and treatment of tricuspid valve disease: current and future perspectives. Lancet 2016;388:2431–42. Stuge O, Liddicoat J. Emerging opportunities for cardiac surgeons within structural heart disease. J Thorac Cardiovasc Surg 2006;132:1258–61. Taramasso M, Vanermen H, Maisano F, et al. The growing clinical importance of secondary tricuspid regurgitation. J Am Coll Cardiol 2012;59:703–10. Rogers JH, Bolling SF. 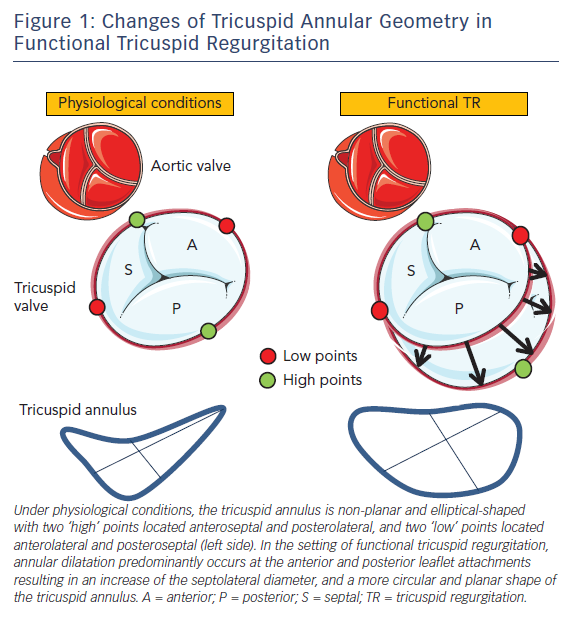 The tricuspid valve: current perspective and evolving management of tricuspid regurgitation. Circulation 2009;119:2718–25. Najib MQ, Vinales KL, Vittala SS, et al. Predictors for the development of severe tricuspid regurgitation with anatomically normal valve in patients with atrial fibrillation. Echocardiography 2012;29:140–6. Chang JD, Manning WJ, Ebrille E, et al. Tricuspid valve dysfunction following pacemaker or cardioverter-defibrillator implantation. J Am Coll Cardiol 2017;69:2331–41. Hahn RT. State-of-the-art review of echocardiographic imaging in the evaluation and treatment of functional tricuspid regurgitation. Circ Cardiovasc Imaging 2016;9;e005332. Takano H, Hiramatsu M, Kida H, et al. Severe tricuspid regurgitation after mitral valve surgery: the risk factors and results of the aggressive application of prophylactic tricuspid valve repair. Surg Today 2017;47:445–56. Van de Veire NR, Braun J, Delgado V, et al. Tricuspid annuloplasty prevents right ventricular dilatation and progression of tricuspid regurgitation in patients with tricuspid annular dilatation undergoing mitral valve repair. J Thorac Cardiovasc Surg 2011;141:1431–9. Nishimura RA, Otto CM, Bonow RO, et al. 2014 AHA/ACC guideline for the management of patients with valvular heart disease: executive summary: a report of the American College of Cardiology/American Heart Association Task Force on Practice Guidelines. J Am Coll Cardiol 2014;63:2438–88. Vahanian A, Alfieri O, Andreotti F, et al. Guidelines on the management of valvular heart disease (version 2012). Eur Heart J 2012;33:2451–96. Pfannmüller B, Davierwala P, Hirnle G, et al. Concomitant tricuspid valve repair in patients with minimally invasive mitral valve surgery. Ann Cardiothorac Surg 2013;2:758–64. Pagnesi M, Montalto C, Mangieri A, et al. Tricuspid annuloplasty versus a conservative approach in patients with functional tricuspid regurgitation undergoing left-sided heart valve surgery: a study-level meta-analysis. Int J Cardiol 2017;240:138–44. Kalbacher D, Schäfer U, von Bardeleben RS, et al. Impact of tricuspid valve regurgitation in surgical high-risk patients undergoing MitraClip implantation: results from the TRAMI registry. EuroIntervention 2017;12:e1809–16. Ohno Y, Attizzani GF, Capodanno D, et al. Association of tricuspid regurgitation with clinical and echocardiographic outcomes after percutaneous mitral valve repair with the MitraClip System: 30-day and 12-month follow-up from the GRASP Registry. Eur Heart J Cardiovasc Imaging 2014;15:1246–55. Schwartz LA, Rozenbaum Z, Ghantous E, et al. Impact of right ventricular dysfunction and tricuspid regurgitation on outcomes in patients undergoing transcatheter aortic valve replacement. J Am Soc Echocardiogr 2017;30:36–46. Barbanti M, Binder RK, Dvir D, et al. Prevalence and impact of preoperative moderate/severe tricuspid regurgitation on patients undergoing transcatheter aortic valve replacement. Catheter Cardiovasc Interv 2015;85:677–84. Ton-Nu TT, Levine RA, Handschumacher MD, et al. Geometric determinants of functional tricuspid regurgitation: insights from 3-dimensional echocardiography. Circulation 2006;114:143–9. Knio ZO, Montealegre-Gallegos M, Yeh L, et al. Tricuspid annulus: a spatial and temporal analysis. Ann Card Anaesth 2016;19:599–605. Fukuda S, Saracino G, Matsumura Y, et al. Three-dimensional geometry of the tricuspid annulus in healthy subjects and in patients with functional tricuspid regurgitation: a real-time, 3-dimensional echocardiographic study. Circulation 2006;114:I492–8. Hahn RT, Meduri CU, Davidson CJ, et al. Early feasibility study of a transcatheter tricuspid valve annuloplasty: SCOUT trial 30-day results. J Am Coll Cardiol 2017;69:1795–1806. Stephan von Bardeleben R, Tamm A, Emrich T, et al. Percutaneous transvenous direct annuloplasty of a human tricuspid valve using the Valtech Cardioband. Eur Heart J 2017;38:690. Rosser BA, Taramasso M, Maisano F. Transcatheter interventions for tricuspid regurgitation: TriCinch (4Tech). EuroIntervention 2016;12:Y110–2. Nickenig G, Kowalski M, Hausleiter J, et al. Transcatheter treatment of severe tricuspid regurgitation with the edge-to-edge MitraClip technique. Circulation 2017;135:1802–14. Lauten A, Doenst T, Hamadanchi A, et al. Percutaneous bicaval valve implantation for transcatheter treatment of tricuspid regurgitation: clinical observations and 12-month follow-up. Circ Cardiovasc Interv 2014;7:268–72. Laule M, Stangl V, Sanad W, et al. Percutaneous transfemoral management of severe secondary tricuspid regurgitation with Edwards Sapien XT bioprosthesis: first-in-man experience. J Am Coll Cardiol 2013;61:1929–31. Campelo-Parada F, Perlman G, Philippon F, et al. First-in- man experience of a novel transcatheter repair system for treating severe tricuspid regurgitation. J Am Coll Cardiol 2015;66:2475–83. Siminiak T, Dankowski R, Baszko A, et al. Percutaneous direct mitral annuloplasty using the Mitralign Bident system: description of the method and a case report. Kardiol Pol 2013;71:1287–92. Nickenig G, Schueler R, Dager A, et al. Treatment of chronic functional mitral valve regurgitation with a percutaneous annuloplasty system. J Am Coll Cardiol 2016;67:2927–36. Schofer J, Bijuklic K, Tiburtius C, et al. First-in-human transcatheter tricuspid valve repair in a patient with severely regurgitant tricuspid valve. J Am Coll Cardiol 2015;65:1190–5. Kay JH, Maselli-Campagna G, Tsuji KK. Surgical treatment of tricuspid insufficiency. Ann Surg 1965;162:53–8. Ghanta RK, Chen R, Narayanasamy N, et al. Suture bicuspidization of the tricuspid valve versus ring annuloplasty for repair of functional tricuspid regurgitation: midterm results of 237 consecutive patients. J Thorac Cardiovasc Surg 2007;133:117–26. Navia JL, Nowicki ER, Blackstone EH, et al. Surgical management of secondary tricuspid valve regurgitation: annulus, commissure, or leaflet procedure? J Thorac Cardiovasc Surg 2010;139:1473–82. Lurz P, Besler C, Kiefer P, et al. Early experience of the Trialign system for catheter-based treatment of severe tricuspid regurgitation. Eur Heart J 2016;37:3543.